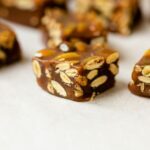 Homemade caramels are great but how do you make them more appropriate for fall? You make them into pumpkin spice caramels of course! Spray a 9×9 inch baking dish with nonstick baking spray. Line with parchment paper, cutting larger than needed to create handles. Spray the parchment and set aside. In a small saucepan, melt the butter and heavy cream over low heat. Once the butter is melted, turn to the lowest heat setting to keep warm. In a large 4-quart kettle, combine the sugar, water and golden syrup (affiliate link). Bring to a boil over medium heat. Once boiling, continue to boil until the mixture registers 310 degrees on an instant read thermometer. Remove from the heat and slowly pour in about 1/2 cup of the warm cream and melted butter mixture, stirring constantly. Continue to stir and slowly pour in the remaining cream and butter mixture until it’s all added and the mixture is smooth. Set back over medium heat. The mixture will have cooled so continue to cook until the mixture registers 248 degrees. Remove from heat. Add the pepitas, cinnamon, ginger, cloves, nutmeg, salt and vanilla. Stir until combined and pour into the prepared baking dish. Cool at room temperature until solid and slightly dry, 6-8 hours. Once cooled, use the parchment to remove the caramel from the baking dish. Using a large, sharp knife, cut into 1-inch strips. Cut the strips into 1-inch pieces. Immediately wrap each piece in a small square of parchment paper. Store in an airtight container in the refrigerator as the golden syrup (affiliate link) keeps these soft. Remove from refrigerator 15 minutes before serving.